WHO AND WHAT IS HOME-COST? Home-Cost provides cloud based residential construction estimating for new single family detached home construction anywhere in the continental United States, Alaska, Hawaii and Canada. Home-Cost was initially launched in 2003 and then introduced as an online residential home cost estimating service in 2006. In 2008 our estimating technology was recognized and granted US Patent #7389255. Home-Cost president Bob Formisano, AIA is a licensed architect, licensed residential builder and patent holder with over 38 years experience in all aspects of the design and construction process. The patented software provided by Home-Cost is unique to the design and construction industry because of its ability to model the cost of virtually any home design, in real time, with or without the use of house plans and at any stage of design. As a user makes choices determining home design and material selections, Home-Cost provides instant cost feedback. Thousands of possible design options coupled with real time cost feedback allow valuable and effective “What-If?” cost exploration of design changes. 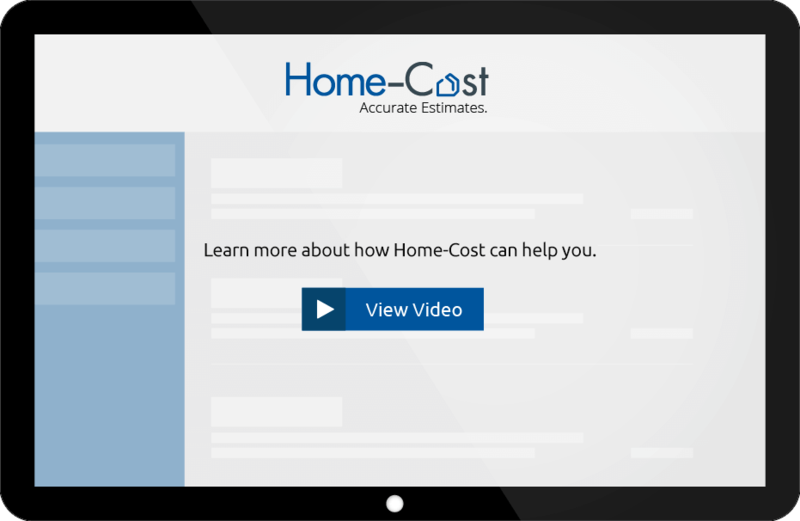 Home-Cost also uses a 5-digit zip code data base providing over 40,000 unique locations for unsurpassed regional accuracy. Home-Cost includes construction options for newer green construction technology such as structural insulated panels (SIP) and insulated concrete form (ICF). Home-Cost also includes costs for site work elements and includes multiple options for components such as site clearing, driveway, walkways, access road, decks, patios, landscaping, irrigation, retaining walls, utility extensions, well, septic and more. The inclusion of these costs is necessary for a complete construction estimate and are often excluded in other estimating applications. Home-Cost promotes responsible home construction budgeting and lending. Home construction projects fail financially because the home design’s size, complexity, and the desired material quality are out of balance with the cost resources of the owner or builder. More serious cost estimating errors occur during the design and preconstruction process than at any other time. This is due to faulty assumptions, unreliable cost data and unrealistic initial decisions related to quality, quantity and resulting budget. In a Home-Cost survey of custom home projects ranging from $260,000 to $1,600,000 (in 2017 dollars), 94% of the projects were initially over budget. The average initial over-budget amount was $160,000 or 31%. Home-Cost brings these budgets back in line. It is the only online cost estimating application that allows consumers or design professionals to dynamically vary the design characteristics and the material options in a home and see the cost impacts of those decisions in real time. Unlike competitive estimating products, Home-Cost Full Function and PRO software users are not limited to predefined categories of quality such as “Economy” or “Premium” or geographically lumped into “cost zones” of the country such as “Southeast.” Instead, users have absolute flexibility to model the cost of their specific home design online for their specific site location anywhere in the continental United States, Alaska, Hawaii or Canada. This is significant because it allows the Home-Cost user to align their scope and quality expectations with their budget early in the design process while retaining the major home design objectives they desire. Too often, would-be-homebuilders find out their expectations of home size and material quality are unrealistic or that they omitted costs such as site development (walks, driveways, patios, utilities, decks, septic, etc). They usually find this out when bidding the project after they are emotionally and financially committed. This results in redesign, delays in construction, extensive and expensive change orders, cutting back on the size of the home or quality of the finishes, inability to obtain construction financing, additional equity requirements or in some cases stopping the project completely. Home-Cost minimizes these risks because users now have the ability to simultaneously explore the size and quality of a home design and get immediate feedback on cost impact. Users gain control in deciding what design features are most important to keep (e.g., size of the home, ceiling heights, material quality and many others) and are able to see the impacts of those choices immediately on the home’s cost.